I posted a picture on Facebook recently that everyone seemed to enjoy so I thought I'd post it here as well. What I didn't do was tell the story as to how this unplanned photo shoot happened. My daughter had a play date at our house with her best friend and they went up to her messy room (they weren't supposed too) to get one toy to play with. One toy became two which rapidly became an assembly line of 100. 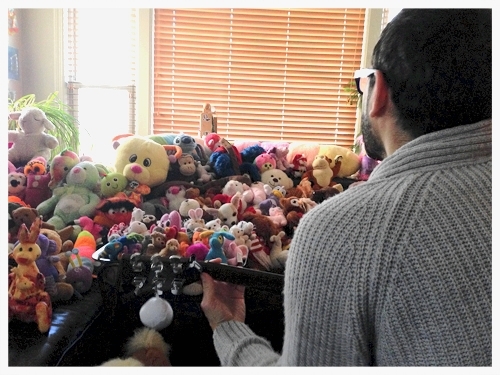 Stuffed animals were gleefully dropped down the stairs by one to the other waiting below who then meticulously set them up. When I asked what they were doing they informed me that they needed all of the animals because they were making a zoo. I can't argue with that kind of logic. So what you see is pretty much exactly what they did on their own. I would have had to pay top dollar to a photographer to set up this kind of shoot and they did happily for free. And because they were playing I think I brilliantly avoided any child labor laws and got an awesome photo to boot. Istvan. I make music and more for cool kids and their families.